The new myVacBot B100robot vacuum doesn't only make the hearts of household-grumpies beat faster. With its new brush design it overshadows the one or another competitor in the matters of floor cleaning. The brushes mounted in v-shape offer an even a bigger suction area that removes even the most stubborn kind of dirt. But not only dust and dirt - even bacteria, mites and other Microorganisms are thoroughly removed. That makes it not only innovative but also reliable and aseptic! Not like its competitors, the myVacBot B100 is equipped with two main brushes. Their v-shaped arrangement offers an even larger absorption surface and clean your floors extremely thoroughly. The myVacBot B100 is featured with an integrated UV Light, reliably killing the most different kind of bacteria. That’s why the it is the perfect partner in the matters of floor cleaning - especially for households with allergy sufferers. Even when you are not at home the robot hoover reliably takes care of cleaning your floors. With less handgrips you can programme one starting time each weekday. The cleaning process will reliably be started at the pre-programmed time. The Soft-Touch function avoids that the robot vacuum collides raggedly with obstacles or walls. 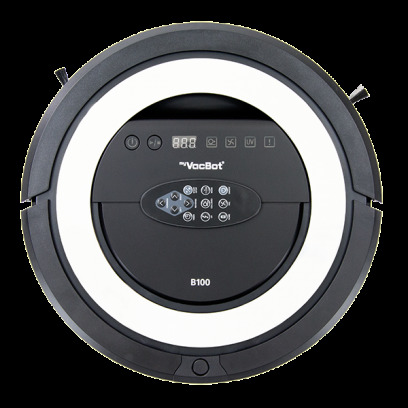 When the Soft-Touch function is activated, the myVacBot B100 lowers its speed when detecting obstacles, to softly drive up to them. Both, dust bin and filter of the myVacBot B100 are easily removable and washable with fresh water. Therefore it is an extremely hygienic cleaning ensured. With the Sonic Wall you can limit the cleaning area. By placing the Sonic Wall in the given area it builds a boundary the myVacBot B100 robot vacuum will never overrun. It is recommended to use the Sonic Wall as a boundary near staircases and abysses, building a drop protection. The robot hoover can comfortably be controlled with its remote control, being stored on its top side. Certainly it can also be controlled by using the buttons on the device. If there occur any problems in using the remote control we recommend to delete the main unit of the device and carry out a new synchronization of the remote control. A useful guideline can be found in the user manual in chapter 19 “setting ID with main unit”. The robot vacuum is able to effortlessly overcome thresholds (like carpets, thresholds, etc.) with a maximum height of 1 cm. The Spiral Mode is the ideal cleaning mode for heavily dirty floors. 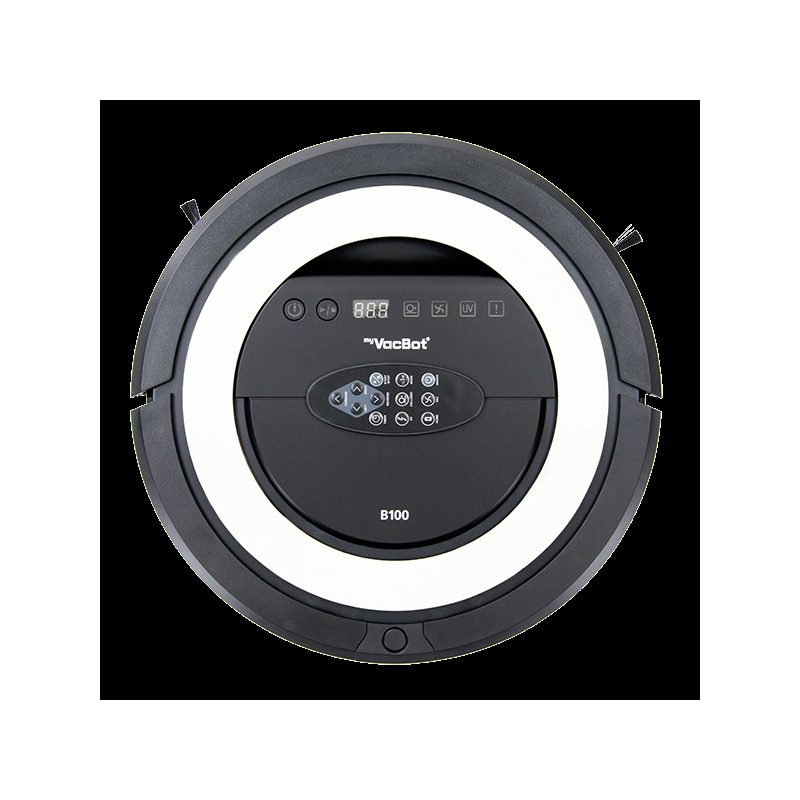 By spirally cleaning the given floors, the robot vacuum ensures convincing cleaning results. To thoroughly remove dirt and dust in edges and corners, the myVacBot B100 drives along walls. This mode is perfectly suitable for rooms with many obstacles. 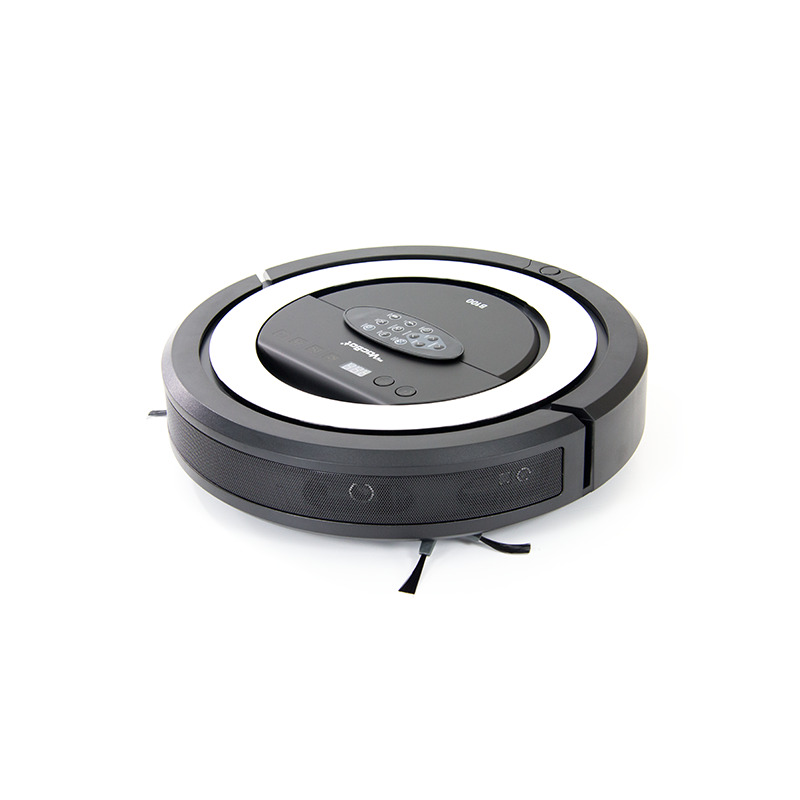 When touching obstacles or walls, the robot hoover will easily change its cleaning direction. Whether toys or furniture – the Special Bounce Mode masters any challenge. In a Zig-Zag pattern the floors are cleaned, being extremely rapid and nevertheless extraordinarily thorough. With the help of this mode, the robot vacuum can clean even hardly reachable spots. It is the ideal cleaning mode for tricky rooms providing many obstacles.